Thats where you mapped the axis to the motors, but can you show me the page where you mapped Darwin motor signals to the motors? I think its under the motors tab? 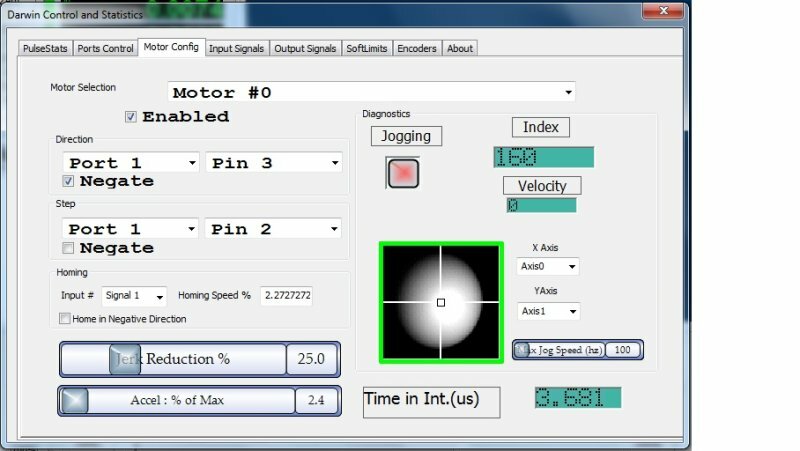 Do you want to see the Darwin driver motor page(s)? in the tuning if they werent available. Do the DROs move if you jog, but not the motors? Does it come out of Estop properly? 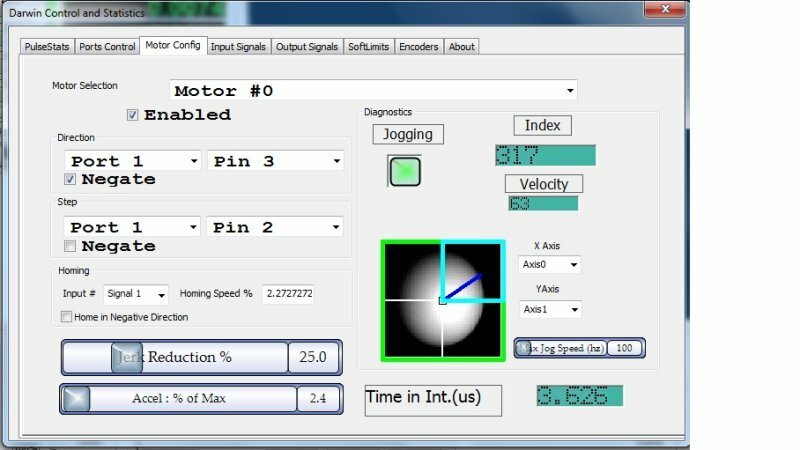 Can you verify any iput signals work? Neither DROs nor motors move. eStop turns the indicator in the Darwin driver and generates the error message in Mach4 history as I showed in a previous port. 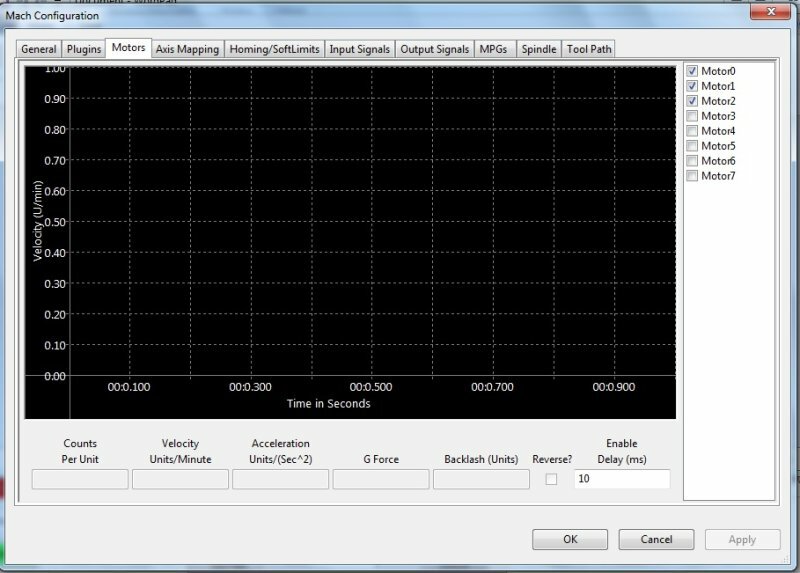 I then stopped M4, started M3, jogged X axis until home switch was activated. Then stopped M3, restarted M4, and see that pin 11 is not off/red. This is the proper pin, configured active low for the X axis home. Your photo of Darwin shows a velocoity when you try to jog, that means it was sending pulses out the port..but the motor wasnt moving..
di that report mean the switch input DID follow the signal, or DIDNT. Are you getting input switch responce? Port/pin numbers do match M3, and home switch did follow the switch itself, so that input pin and eStop are being seen by the driver. I'm going to remove the cover on the computer and try to observe the LEDs on the BOB while attempting jogging. It sounds to me like your hooked up fine, things should run. But if the DRO's arent moving, then Auggie isnt trying to jog. If Auggie sends out steps, the DRO's will count, so it has ot be something more basic than that..
No BOB led's lit when attempting jogging with Darwin driver. However, X & Y DROs in M4 update after I close the dialog. yes, it sounds like either the pins arent right, the home switch works so it must be the right port. Sure you didnt swap dir and step? I set as enabled the 3 output signals as in M3 (pins 1, 16, 17). What's interesting is that motor3 never has the jogging indicator go green, while motor0 and motor1 do so. There's nothing different about it in how it's configured other than pin#s.